Before you go and blow $50 per bulb on Philips Hue smart lights that can’t even function unless you also buy a Philips Hue hub, check out the deal we just found on Amazon. 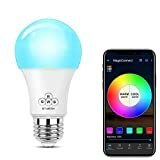 For just $16 each, you can pick up MagicConnect Bluetooth Mesh Multicolor Light Bulbs that feature 16 million colors and app control, just like Philips Hue. Unlike the pricey alternative though, these bulbs can use Bluetooth mesh technology so you don’t need a hub or even a Wi-Fi connection!